Looking to Improve Your Horsemanship? Aren’t we all? As equestrians, we know the learning never ends. I have a friend who just started taking riding lessons as an adult. She is a voracious learner and is always striving to be her best in all realms. I mentioned that I was going to take a lesson over the weekend and she questioned, “you still take lessons? Haven’t you been riding most of your life?” Of course I still take lessons and not enough! Not that I am anywhere near the Olympic level, but yes, even Olympic equestrians take lessons, and a lot of them. There is always room for improvement. 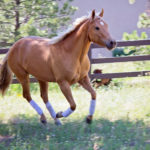 In contract to other sports, equestrians are working to partner with at 1000+ pound animal, the only domestic animal that could still survive in the wild, with its own thoughts and ideas. One of my personal goals is to improve my riding and my level of horsemanship this year. So far, I have been to a four-day clinic and two, two-day clinics. They have improved my riding significantly and there is real value in the intensive attention and saddle time you and your horse receive at a clinic as well as what we learn from watching others with different horses. If stepping up your horsemanship is one of your goals this year, here is the perfect opportunity! Nationally known clinician Kip Fladland is coming to the Event Center at Jeffco Fairgrounds in Golden September 15-17th. Last year, several area riders who have travelled in previous years to Kip’s home in Iowa for clinics, brought Kip to put on a clinic at a private venue in Conifer. This year Andrew and I have picked up the reins, so to speak, to bring Kip back again. 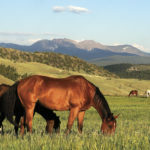 Born and raised in Montana, for the last 30 years Kip has devoted his life to working with and riding horses on several large Montana ranches as well as at his place in Iowa. While working in Montana, Kip met Buck Brannaman and attended several of his clinics. Buck asked Kip to join him on the road as a clinician, which Kip did for 5 years. Following his time with Buck on the road, Kip was eager to use the skills he had learned to work with starting colts under saddle as well as problem horses. He works with all breeds including quarter horses, thoroughbreds, warmbloods, gaited breeds and mules. These horses go on to compete in dressage, hunter/jumpers, three day eventing, reining, cow horse, cutting and of course as working ranch horses and trail horses. In his 15 years of teaching clinics, Kip has found great satisfaction in facilitating people to communicate better, have fun and enjoy their horses more, no matter the discipline. Across the country, Kip has found that the issue that riders struggle with the most is lateral bend according to their horse’s feet. Kips wife Missy is a dressage trainer who also seeks to emulate the horsemanship masters such as Ray Hunt, Tom Dorrance and Buck Brannaman. 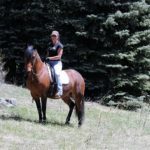 Missy has several regional and national titles in addition to earning her USDF Bronze and Silver medals on horses that she has trained and brought up the levels on her own. Two, three day classes will be offered September 15-17. You can do one class or both. Registration is now open and ends on September 1st. Lunch will be served and auditors are welcome! Groundwork will be from 9am-12pm all three mornings. This class focuses on groundwork exercises and ends with time in the saddle. Horsemanship 1 will be from 130-430pm all three afternoons. This is the perfect class for all levels of horses, riders and disciplines. Think you are too green or maybe too advanced? Not true! No matter your level or your horse’s, the format and foundational principles embedded in this clinic will improve your horsemanship and communication with your horse. Don’t miss this chance to advance your skills! Spots are limited! Call today with any questions and to reserve your spot! Stalls & RV hookups available with reservations at Jeffco Fairgrounds in Golden, CO 303-271-6600. Hotels and restaurants within 5 minutes of venue. See lariataranch.com for more information on Kip. Enter both classes or just one. $450/class, $150 non-refundable deposit to reserve your spot. Auditors $25. Organizers: Heather & Andrew McWilliams 303-638-0994.